Goodness, I know this has been done to death since Colourpop launching onto the scene with these lipsticks years ago, but I have got my hands on some at last, and I’m so happy I have to share this with you. That said, it’s still taken me months to get this review going. Almost all of mine were bought from re-sellers but I’m pretty happy with them and convinced they’re the real thing. That said, I can’t believe there are even fakes out there. I also can’t believe that people are charging almost double the original price when re-selling. Luckily I bought my re-sold ones for maybe 50p more than I would have officially. Colourpop’s Ultra Matte Lips come in tubes of 3.2g (0.11 oz) of product for $6 (about £4.80 at the time of writing). Shipping from Colourpop directly to the UK is $9.99. If you buy only three Matte Lips in your order you shouldn’t get any customs charges as the total would be under the limit of £15. So if you do that, your total spending (lips and shipping) would come to about £7.50 per lipstick, which isn’t bank-breaking! If you are making a larger order though, be aware that you will probably have to pay for customs and handling.You can also wait for free international shipping offers, which they do occasionally, but it does mean you might miss out on limited collections. Colourpop sends their products out in a sturdy cardboard box with plenty of inside padding. Each product also has its own card box. The Ultra Matte Lips come in see-though tubes with the name of the shade on a sticker at the base. The Colourpop branding on the tube rubs off very easily after carrying it around for a while – unfortunate, but a minor gripe considering the price. The products have a doe foot applicator, although I noted that the applicators are not always the same. Behold! The applicators for (L-R) Bumble, Speed Dial and Tulle. Speed Dial is smaller while Tulle is fluffier, and holds more product, and somehow even if I scrape off product I end up with way too much. I prefer the less fluffy ones, regardless of size… Although If I had to pick I’d prefer the more precise smaller one. I agree with most of Colourpop’s claims to the formula (the consistency varies slightly from shade to shade). I know that people are quite divided over how drying they can be, with some saying it turns their lips into a desert and others saying it’s quite comfortable and not too much. For me, this is the latter – a great matte that my lips can withstand very well all day. Seriously, this stuff lasts. Sometimes matte lipsticks can be tacky to touch but the Colourpop formula isn’t at all. The finish dries down to look matte very quickly, but it takes a few minutes longer for it to completely transfer proof (I will note exceptions down for separate colours). During that extra drying time it will transfer onto mugs and stuff. In my experience, these lipsticks last well through a meal unless it’s particularly oily. In terms of wear, it’s possible to have it on all day and not have any very noticeable wear. However, it will feel quite drying towards the end of the day. I can get comfortable wear for around 6 hours before the dryness sets in, but this might be different for you. Are these hard to remove? Not particularly, but it does take more patience than other lipsticks. I carefully rub with a cleansing milk usually but for the swatches I used a cotton pad drenched in L’Oreals’ Micellar Gel which I’m trying to use up. Okay everyone, I just want to give you a bit of warning. I’m trying out some photo related things for the blog so I really really went ham on the swatches! Also, it’s still pretty freaking miserable in terms of weather and lighting in the UK at the moment, so I’ve noticed mine look a little different to others I’ve seen. For skintone reference, I’m about a NC15-20 in MAC shade and my best match is Estee Lauder in 1W2 Sand. Guess – This is a super dark purple. It’s not the best formula in the collection as it can be a bit streaky in places, but with a lipliner underneath, this is fine. I love the colour but can’t wear it often as it accentuates any redness in the skin, so I can only wear it on a great skin day, even with foundation. It’s similar to NARS’ Velvet Matte Pencil in Train Bleu, although Guess is closer to black. Comparison swatch – Colourpop Ultra Matte Lip in Guess VS NARS Velvet Lip Pencil in Train Bleu. Bumble – An autumn favourite of mine, this is a ‘burnt terracotta’ which is to say, it’s a really warm, earthy and deep red-brown. It’s very similar to the Rimmel 1000 Kisses Lip Liner in Spice, although redder. A shade I could wear every day. This has the thinner, truly lightweight consistency and just looks perfect all day. Tulle – Another classic from the collection, Colourpop describe this as a dusty mauve burgundy, which is to say, it’s a very dark pink-brown. I don’t have any similar shades to this. If I want to look like and pretend to be a trendy and cool teenager, this is the one I reach for – it just gives off those vibes! As mentioned, this one applies more thickly due to the applicator so isn’t as lightweight. Scrooge – A medium raspberry pink. I’m not usually one for pinks, but this is lovely and I can see myself reaching for this often. I want to add that this shade was really hard to capture with my camera. There’s definitely a purple hint that I couldn’t catch. This is another unique shade in my collection – I’m not usually one for pinks. This is also a shade with the thinner consistency. More Better – A deep, medium-dark pink/purple shade (you could say it’s a darker version of Scrooge). 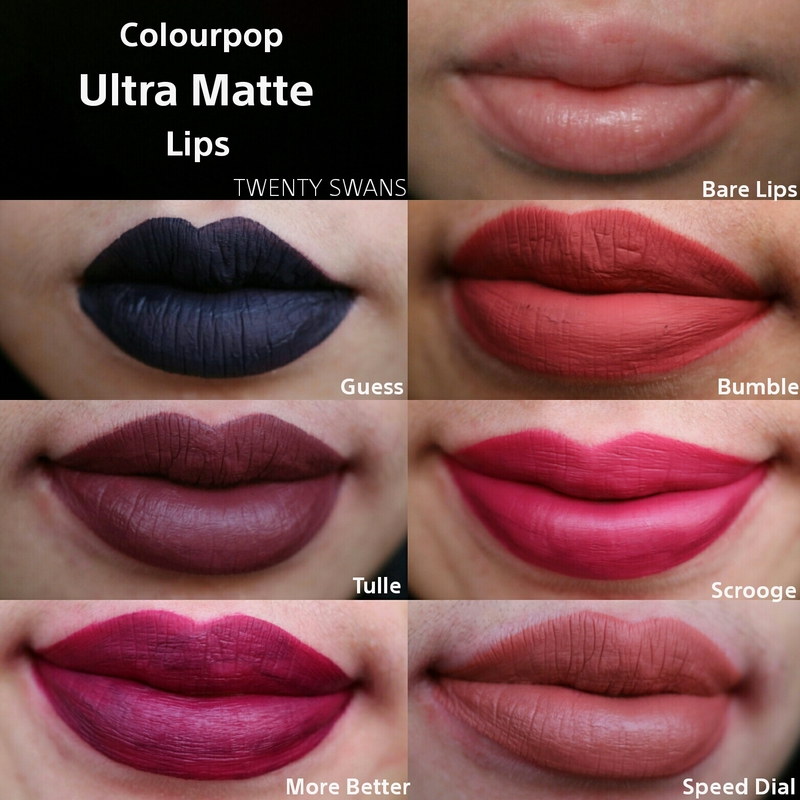 I was hoping for something both dark and bright judging by swatches, but on my skintone it’s definitely more a deep berry shade similar to others I have in my collection (I think Scrooge better fit my expectations there). It can also be a bit uneven in places but I’ve noticed that this doesn’t happen all the time – wore it the other day and it wasn’t patchy at all?? This is another colour with a heavier texture and it never was transfer-proof during the day – stayed on my lips fantastically but somehow also came off on everything! Colourpop More Better Comparison Swatches – Rimmel Lasting Finish 107, Maybelling Colour Drama Pencil in Berry Much, L.A. Girl Pigment Gloss in Rebel, and Revlon Balm Stain in Crush. Speed Dial – A muted peachy brown and part of their newer peach collection, this is similar to NYX’s Lip Lingerie in Ruffle Trim but darker. It’s more expensive than Lip Lingerie including shipping, but as I bought this during their Free International Shipping offer, it actually turned out cheaper. 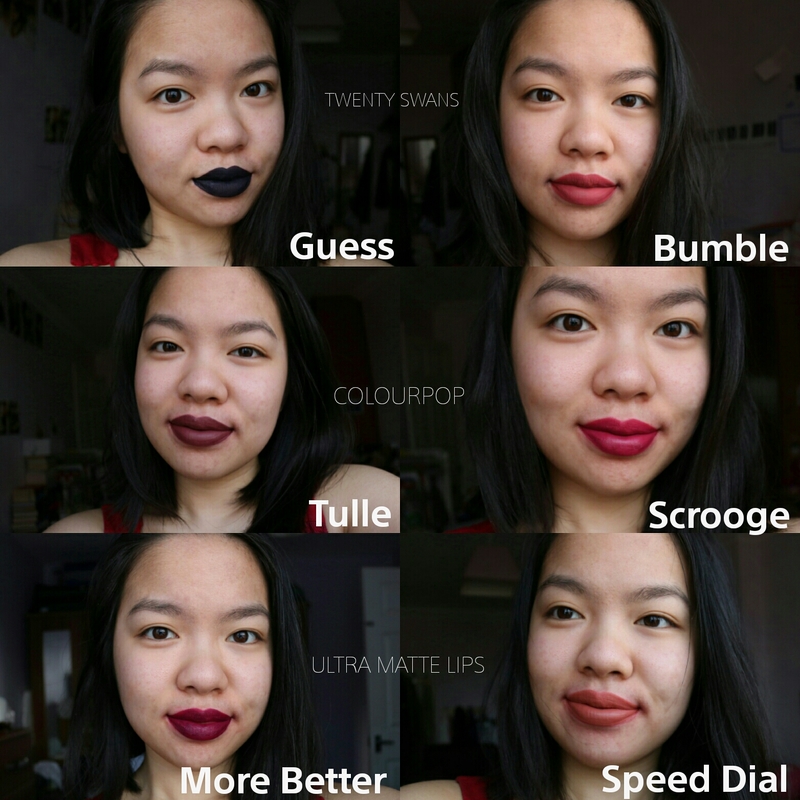 Colourpop Speed Dial Comparison Swatches – NYX Ruffle Trim, New Look Pure Colour Lip Liners, Bourjous Beau Brun, and WetnWild Bare it All. Overall, I am definitely a fan of these lipsticks and would go as far as to say they’re my favourite liquid lipstick. Colourpop have a winner in that they have a lot of unique shades and a great price point that ensures people are tempted to give them a try even if they might not like the hit-or-miss formula.